Did you know videos increase understanding of a product or service by 74%? Or that 90% of internet users agree that videos help them decide whether or not to buy a product? Videos are easily the best way to capture and retain attention online. But making a professional-grade video means having a large enough budget to do so. If you don’t have the budget or in-house capabilities, there’s an alternative option: animated GIFs. GIFs are easy to make and implement on a website, within your content, or even in an email. They’re a great way to display a product in action, show a tutorial, or visualize the benefits of using a product or service. They’re also commonly used to add a little bit of humor and personalization to content. Why should you consider using GIFs in the first place? GIFs aren’t just some goofy file format that you can’t identify as a video or image. They’re a vital part of the content marketing world and can be used in practically every digital environment, ranging from Facebook posts and tweets to comment sections and forum threads. They increase the shareability of content, can depict products and demos effectively, and add a little life to otherwise bland text articles. Let’s explore four sites and tools to help you make use of GIFs in your future content. This is my personal favorite tool to make GIFs. Not only is it free, but it allows you to capture any region of our computer screen and record for as long as you’d like. One of the biggest benefits of Licecap is that you can quickly help customers who have a specific problem. In seconds you can record a solution to the problem and send them over the GIF. Compared to a lengthy paragraph, this is an excellent alternative, and it may earn more respect and praise for a customer service representative. Useful for an array of reasons, imgflip has two primary features. The first is being able to enter any video URL such as a YouTube link or upload your own video file and convert a custom section of the video into a GIF. The second is being able to upload multiple images and convert them into a slideshow GIF. There are often times when a digital product/service works in tandem with another platform such as Facebook or Twitter. Along a similar vein, software may have certain requirements prior to installation. You can snip long YouTube videos to pick out sections that explain how to update something or navigate to a certain feature. This creates a better user experience for our users because they don’t have to sift through a video to find one specific bit of information. The second feature – the ability to create GIFs from a series of images – presents a nice and simple alternative to those who do not own or have the budget for high-end video equipment. You can take photos of our products and services in a custom, sequential order to highlight features, benefits, and more. GIFs created on imgflip come with a subtle watermark in the bottom left corner. While imgflip is a free-to-use tool, removing the watermark requires a $9/month membership to the site. While Giffing Tool is free, it follows the same format as imgflip and places a subtle watermark on GIFs. To remove the watermark, Giffing Tool offers a “Pay What You Want” model, where you enter any amount and receive access to the watermark-free version. Sometimes you simply want to add humor or personalized elements to your content. For these situations, many websites use entertaining, recognizable GIFs. Giphy is one of the most popular and updated sites hosting a variety of GIFs. You can browse the organized categories and quickly find a relevant GIF to spruce up your content. Entertaining GIFs are often used in articles to break-up a long piece of text. They’re good for comic relief or as a way to make your point. Also, did you know you can insert GIFs directly into emails in Gmail? Try testing out a GIF in your next email marketing campaign to see if it results in higher click through rates. The sites and tools we’ve covered will help you quickly implement GIFs on any type of digital content. 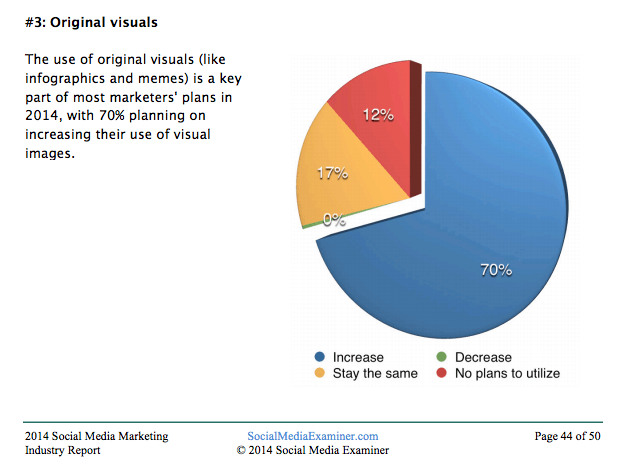 With 70% of marketers planning to increase their use of original visual assets in 2015, there’s no better time to get on the GIF train than right now. The journey of the buyer is tethered to your on- and off-site content. Using GIFs could easily improve your lead acquisition and conversion rate, especially if your current product and service pages have few visual assets. They help beef up content, whether it’s a feature description or an article, and give your brand a little more flavor. Have you ever used or considered making custom GIFs? Let us know your thoughts in the comments below.